Ride with improved skills and knowledge after taking our Motorcycle Skills Program. Valley Driving School’s exclusive closed-cicruit training course is geared specifically to build, challenge and refine rider capabilities at every skill level. 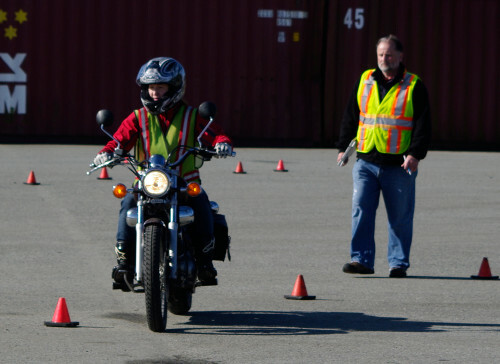 Our relationship with ICBC enables our Instructors to conduct the Motorcycle Skills Assessment (MSA) on-site so there’s no need to book and test through ICBC. We cover topics that are relevant to motorcycle riding to ensure our students acquire the skills and knowledge beyond the required ICBC motorcycle skills test (MST) requirements. Students will become safe and confident riders while being introduced to the freedom and fun of riding a motorcycle. Our Motorcycle Skills program is an ideal blend of in-class theory instruction and closed-circuit training resulting from years of innovation and our dedication to keeping motorcycle riding safe and enjoyable. Valley is well known as a developer of dependable and knowledgeable Instructors who have over 100 years combined experience. Our Instructors ensure every student receives personal attention, which allows riders to progress at their own pace while experiencing the thrill of riding a motorcycle. ***Motorcycle Skills Assessments (MSA) are conducted at our locations with our Instructors who are Certified Assessment Officers. MSA does not guarantee that ICBC will issue a license: ICBC may require a Certified Trainee to be retested by a Driver Examiner; and ICBC will have access to the Trainee's training and assessment records.